Pictures should be in jpg format as email attachments: text can be a simple email or an attached Word document. All contributions will be fully credited. Friday meetings start at 7.30 pm, ending promptly at 9.15 pm. Wednesday meetings start at 1.00 pm, ending at 2.45 pm. Wednesday 24th April: Marylebone Out and Back. Ken Grainger illustrates with slides a journey from Marylebone to Grendon Underwood Junction and back via High Wycombe and Aylesbury. Friday 26th April: The East Coast Main Line during the Steam Era - Part 4 (Grantham to Kings Cross). Steve Armitage resume his digital presentation on the ECML. Friday 10th May: Euston and Destinations - Part 2. A slide presentation by John Hooley featuring routes which "branched off" from the West Coast Main Line. Please note that this is the second Friday. Members' personal data will be used by the Manchester Locomotive Society only for the purposes of administering the Society and informing you of its activities. The Society will not disclose any personal information to any third parties, except where required by law, without your express consent. By joining the Society, you consent to receiving the Mancunian, notices of General Meetings, occasional information regarding special events or outings and other information of legitimate interest to members. Should you wish to change the data we hold for you or opt out of receiving the Society publications or notices, please inform the Membership Secretary in writing. 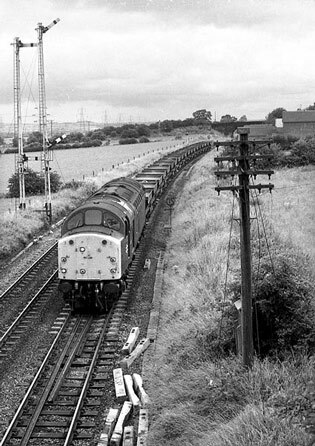 There is a very interesting new feature article concerning loco 37 422 at work on the Cumbrian Coast in 2015 and 2017. It is written by Charlie Hulme and features the photographs of Dave Garrett and the text of Charlie's recent Mancunian article. Enjoy. The above document can be found in the Members-only section of the website. (Password required). 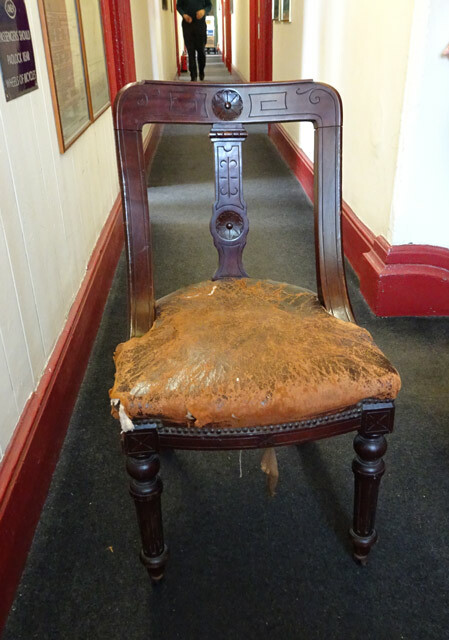 This chair, which has been in the Society's possession for a considerable length of time, was brought back into view recently at our headquarters. The chair was certainly in use when our meetings were held at Sale Station up to the beginning of the nineties and before we moved to Stockport. It could very well have been present when the Society was inaugurated at Manchester Central back in 1935! If that was so, could it's origins be traced back to before the Grouping? The front legs of the chair have castors which has led to speculation that it could have been used in a dining car, the castors enabling the attendant to wheel the chair behind the diner, to make the sitting process easier. Although the leather covering is showing a great deal of distress, the wooden frame is in excellent condition. It carries simple but pleasing carvings on the woodwork. Can anyone shed any light on this fine piece of furniture? 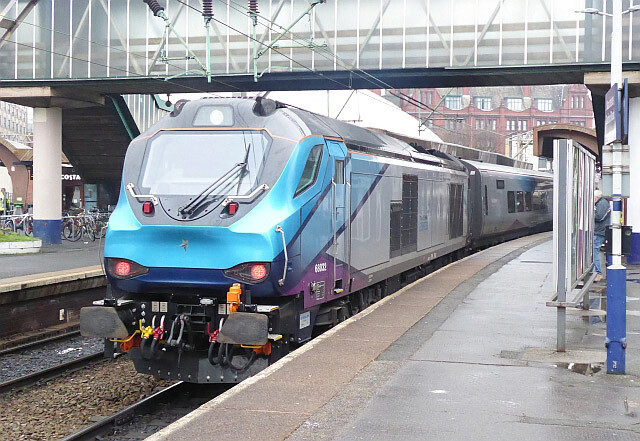 Electric trains began operating in passenger service on the Bolton line as from Monday 11th February. Only just over a third of trains are electric pending the completion of the new power feeder cable from Heyrod (north of Stalybridge) to Manchester Victoria. A full electric service should operate from May 2019. Class 319s are now operating the following services via Bolton: 50% of trains between Manchester Victoria and Buckshaw Parkway and 33% of trains between Manchester Airport and Preston (Northern services) and Manchester Piccadilly and Blackpool North. It has taken 10 years from when this electrification scheme was first announced! The operators of the new Transport for Wales franchise, Keolis Amey, have said that they do not plan to continue the Club 55 ticket offer (unfortunately). Trans-Pennine Express is carrying on with Club 55 but they have not yet announced when the next offer will start. This is thought to be the first-ever open day at Crewe Diesel Depot, now the home of Jeremy Hosking’s Locomotive Services Limited. The Open Day will be from 09.30 to 16.00 and is being organised by Virgin Trains, Locomotive Services Ltd and Railway Magazine. There will be steam, diesel and electric exhibits. A maximum of 5,000 tickets are to be sold (at £12.50 each for adults) on a first-come, first-served basis. You can buy a ticket (if there are any left!) online at https://www.classicmagazines.co.uk/promotion/allchange. Readers without internet access should call 01507 529529 to obtain tickets or write to: Crewe Open Day Tickets, Customer Services, Mortons Media Group, Morton Way, Horncastle, Lincs, LN9 6JR, enclosing a cheque payable to Mortons Media Group. It was announced on 21st December that the Virgin West Coast franchise had been extended to March 2020. Trains have not run to the halt on match days since December 2017, allegedly due to a lack of train paths on the busy corridor through Oxford Road. The Wayfarer ticket increased in price to £14 adult, £7 child, £9.20 for anyone holding an English National Concessionary pass and £28 for groups (up to 4 people no more than 2 of whom are adults) as from 2nd January 2019. We are now told that there will be no enhancement to the train service on the Mid Cheshire Line via Altrincham from May 2019. Network Rail claims that running more passenger trains on the line would lead to increased risk at level crossings. As you may have heard, an agreement was reached in the long-running dispute between Northern and the RMT on 6th February. The strike day timetable still operated on the following Saturday, 9th February, because there wasn’t time to change it but services have run normally on Saturdays from 16th February. Trains between Stockport and Chester will be replaced by buses due to engineering work all day on Sundays 17th and 24th March. The miniature railway at the Brookside Garden Centre in Poynton has reopened with a new operator. There is to be a Grand Re-Opening Day on Sunday 24th March from 10:00 am to 4:00 pm. Partnering up with Royal Manchester children’s hospital charity; train rides, live jazz band performances, vintage fun fair rides, and lots of train fun will all be available for one day free of charge - all donations will be collected by The Royal Manchester children hospital’s very own Humphrey bear &Co.
A zonal fare system was introduced on Metrolink as from 13th January 2019. From that date it has no longer been possible to buy Metrolink single or return tickets from Altrincham station ticket office. Return tickets have been replaced by day tickets for any combination of zones and you can now buy 28-day season tickets (as well as 7-day season tickets) from the station ticket machines without needing a photocard or a Get Me There card. The increase in frequency on the Ashton line to every 6 minutes started as from Monday 28th January 2019. Altrincham to Hale has been announced as a potential route for a “Pathfinder” tram-train scheme in Greater Manchester. The minutes of the above meeting can now be found on the Members Only section (password required). Click on Reports. These two photographs were taken on May 5th 1980 on the occasion of a family day trip to North Wales. Stopping off at Helsby to photograph the impressive semaphores, 40038 came by with a fully fitted empty ballast train (left). 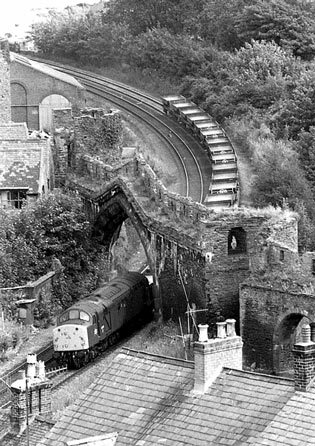 Two and a half hours later what appears to be the same working is seen from the town walls at Conwy. Because I cannot read the loco number in the second shot, it's impossible to be certain whether it is the same train....but it could be! Trans - Pennine Express Test Working. 68 032 is photographed propelling the 09.38 Carlisle - Manchester International Depot empty stock trial working through Manchester Oxford Road station at 13.00 on the 24th January. This was booked to run Monday - Friday that week in an 'as required' path, which is included in the winter timetable, but was cancelled on two days. Photo and information by Charlie Hulme. Older items can be found on the Archive page.